I am so glad I started making yogurt once again. Dahi as we call yogurt, is an everyday thing and we were generating a lot of plastic cups apart from relying on a dahi that was not real. Making dahi at home gave way to collecting the clotted cream from milk and processing it to make ghee too sometimes. 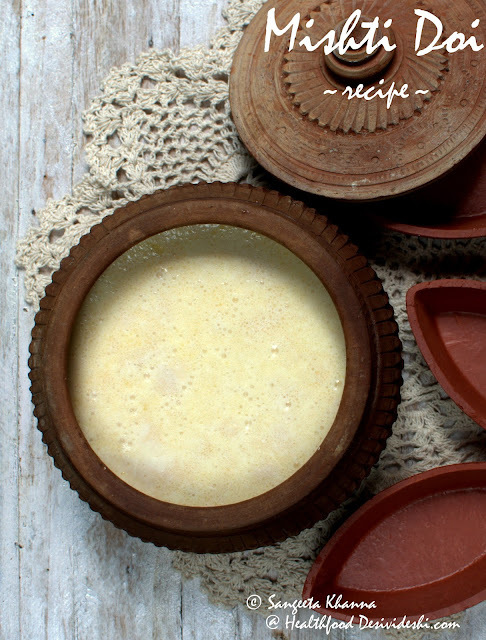 But we consume full fat milk and yogurt everyday, the clotted cream (malai) is collected rarely so ghee making is not too frequent, I would like it more often as it gives fresh real buttermilk as a side product that I love. I will share the ghee making process soon, because home made ghee is the best. Not that I don't buy any from the market. 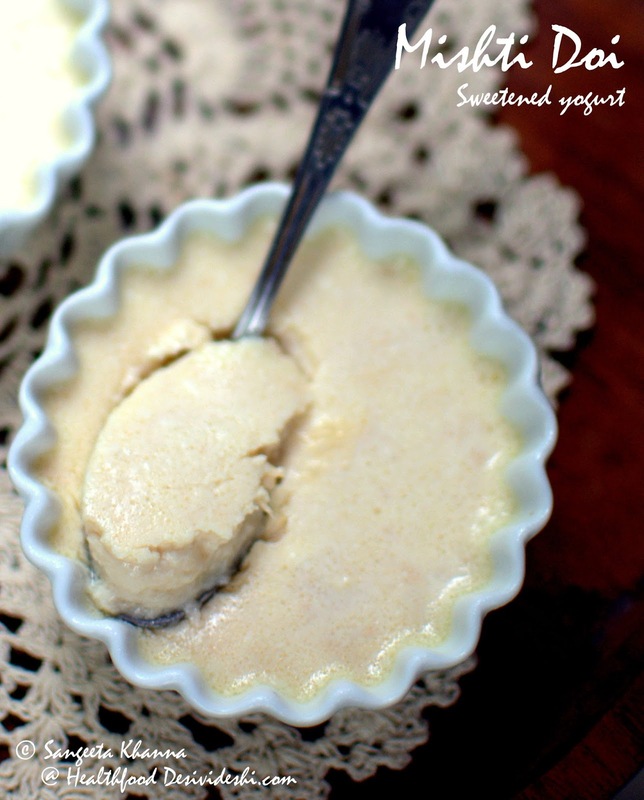 When I posted the home made yogurt procedure some time ago many of you asked for a Mishti Doi recipe too. 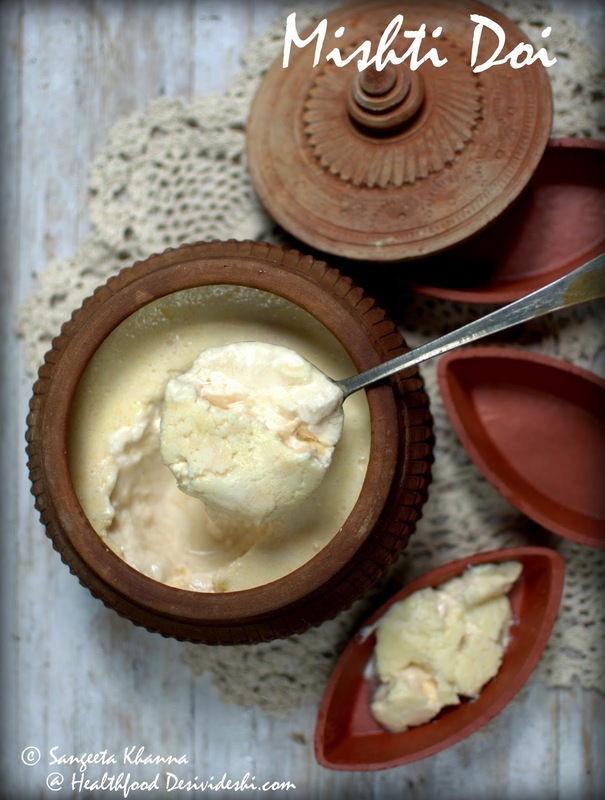 Mishti Doi is a popular sweetened (caramelised) yogurt from Bengal that has become popular all over the country. To say the truth, I used to make Mishti Doi very frequently till my yogurt making habit suffered and I resorted to Mother Dairy. 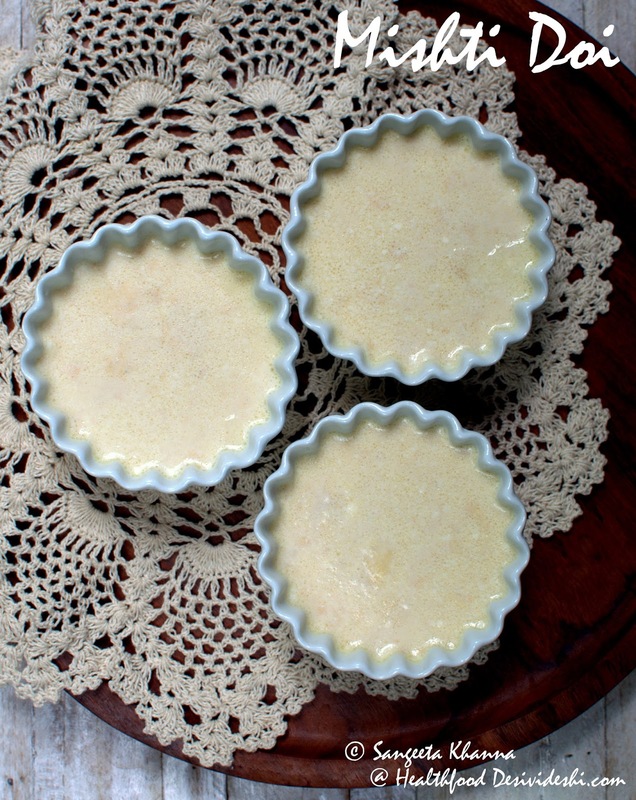 I had even posted a Mishto Doi recipe on Banaras ka Khana blog. I must tell you we both love the Mishti Doi from Mother Dairy and that was one reason I stopped making it. 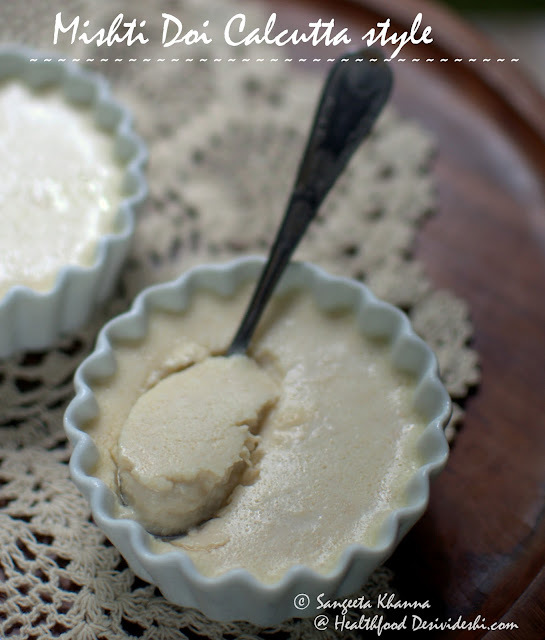 But when many of you wanted a Mishti Doi recipe and Prasad Np and Sushmita reminded me a few times to share it I had to make it again and click pictures, reason enough to share again. The older Mishti Doi recipe uses condensed milk and is way too sweet for me. I made it twice with 2 slightly different methods and sharing both of them with my notes on taste and texture. Reduce milk over medium flame till it becomes 500 ml. Cool down till it becomes lukewarm to touch. About 45 C.
Add the palm sugar and the yogurt and whisk well till the milk gets frothy. Use a wire whisk to do this and whisk vigorously. This helps emulsify any fats that may clot at the surface when the yogurt is set. Now strain and pour in the earthen pot or a ceramic or glass jar. Keep in a warm place for 4-5 hours or till set and smells like yogurt. Slow reduction of milk naturally caramelizes the sugars in milk (lactose) making the colour brownish, in this recipe a little color is enhanced by the palm sugar too. I used very little palm sugar as we eat mild sweet desserts so the flavours of the palm sugar are not too prominent. This mishti doi is quite delicately flavoured and mild sweet. The creaminess is lesser because of less fat content. 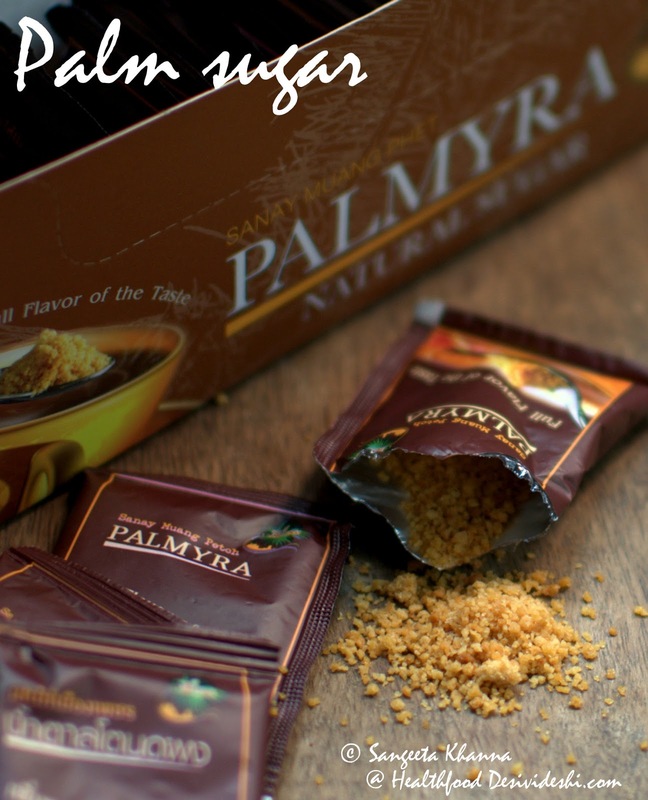 The sweetness is mild and flavourful due to the palm sugar. Reduce the milk by simmering it over medium flame till the volume becomes half. Cool till it becomes lukewarm to touch. Meanwhile, caramelise the sugar. To do this, add 1 tbsp water to a flat base frying pan, add the sugar and place the pan over high heat. Keep rotating the pan so the sugar dissolves quickly over heat and starts getting brown at the edges. Keep rotating so the sugar doesn't burn at one spot, the sugar melts and gets browned within a minute or so, taking the consistency of honey. Now pour this into the cooling milk. Stir to dissolve. Once the milk is lukewarm, add the cream and yogurt and whisk well till frothy. Strain and pour into desired pot or individual serving pots. Keep in a warm place till the yogurt is set. This one will be more creamy and sweeter. When you use caramelised sugar to get the colour you can't do with light sweetening. This one was not too sweet but just like the Mother Dairy one. Remember milk has some sugar too, which makes it sweeter when milk is reduced. Too much sugar would prevent setting of the yogurt and will spoil the taste of yogurt. You wont want sugar to hit your palate first. You can add some saffron or cardamom while whisking in the yogurt culture, but I like it plain. We sometimes have it with toppings of nuts or dried fruits or even shredded aam papad. Srikhand is another yogurt based dessert from Maharashtra which is made by whisking hung yogurt so much that it becomes creamy and smooth. Srikhand can be flavoured with fruits, spices like cardamom and saffron etc too to be served as a dessert, but plain sweetened Srikhand is eaten with poori too I got to know. I have never tried and I don't intent to either. Mishti Doi always is a proper dessert, sometimes served with a rasgulla dipped into it. The first time I ate a rasgulla dipped in Mithti Doi was at the wedding of Arvind's Bengali friend in Banaras about 2 decades ago. We were not married back then and I remember I was being treated to all sorts of good mithais and mithai combinations because G's father was very fond of Arvind and me. Making you eat more mithai indicates more love in our country :-) It is well worth gobbling all that mithai if it is good old Rasgulla and Mishti Doi served together. They make a great combination. Try it sometime and let me know. Mmmm...I remember having this when young! 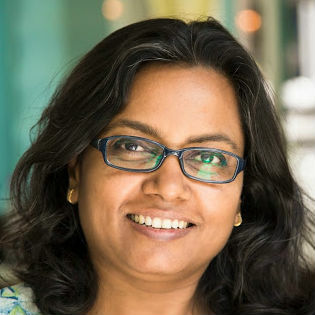 Seems so doable when you share it, Sangeeta! Thank you! Hope you try it Corinne :-) Thank you! What a lovely refreshing treat, and so easy to make! Thank you! This was a brand of palm sugar from Thailand a friend had gifted me Jay Biswa.